The Taj Mahal is an iconic white marble mausoleum on the bank of the Yamuna river in the Agra city of Uttar Pradesh. Taj Mahal was chosen as one of the new 7 wonders of the world in 2007. Taj Mahal is so beautiful that visitors are totally hypnotized by the breathtaking views. Taj Mahal is also very mysterious as there are so many secrets about it. 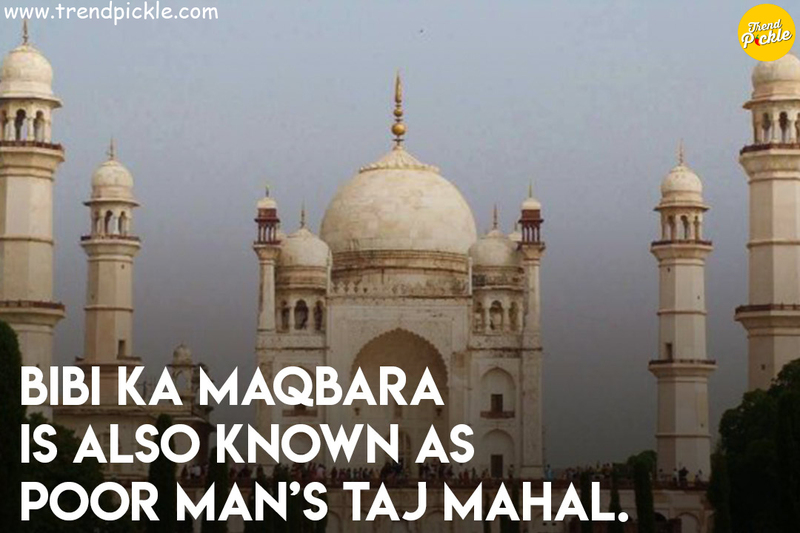 Here is a list of 10 Taj Mahal Secret mysteries you must know. The Black Taj Mahal is a black version of the iconic Taj Mahal that was planned to be built across the Yamuna River opposite the Taj Mahal. Shah Jahan had desired a mausoleum for himself similar to one he had built in memory of his wife – Mumtaz Mahal. Ae per Historian Jean Baptiste Tavernier, Mughal emperor Shah Jahan started to build his own tomb on the other side of the river but could not complete it as he was deposed by his own son Aurangzeb. However, many modern archaeologists believe this story to be a myth. Taj Mahal changes colors from morning to night. The amazing surface of the white marble changes its color at different timings of the day. If you ever get a chance to visit the iconic monument, you should notice the changing mood of the Taj Mahal. It appears somewhat pinkish in color in the morning, while in the evening it appears milky white. Let’s have a closer look at the different colors of the Taj Mahal in below picture. The most horrifying theory about Taj Mahal is that it was never built by Shan Jahan and it existed much before Shah Jahan reigned Agra. According to the book “Taj Mahal: The True Story” by Purushottam Nagesh Oak, the monument was originally a temple dedicated to Lord Shiva built by the early Rajputs of Agra. The book claims that pinnacle of Taj Mahal bears the Trident (Trishul) which is an exclusive symbol of Lord Shiva. The temple was named as Tejo Mahalaya which was conquered by Shah Jahan when he won a battle against the Rajputs. Shah Jahan later adopted it as a tomb. This is a very controversial theory about Taj Mahal which has not been validated yet by any government bodies. Also Read - Closest Point to The Moon on Earth? It is not Mount Everest. There are four minarets in Taj Mahal which surround the tomb. When you see the Taj Mahal, The minarets look perfectly upright. However, the pillars are actually lean outward. It is done as a precautionary measure to save the actual tombs at the times of earthquakes. If there is an earthquake happens and the minarets fell, they would fall away from the main structure without causing any harm to the main structure. All the four sides of the Taj Mahal are completely identical creating surprisingly mirror image for the visitors on each side. Inside the Taj Mahal, the tombs of Mumtaz Mahal and Shah Jahan are enclosed in an eight-sided chamber and a marble lattice screen. However, these gorgeous tombs are just for show for the tourists. The real graves are kept in a quiet and sealed room at the basement level. The one little passage near the staircase leading to the main marble structure was sealed more than a decade ago with a brick wall. This means now there is no way to enter the sealed chambers below the Taj. Mumtaz Mahal died delivering her 14th child in Burhanpur, a town in Madhya Pradesh. One of the most interesting facts is that the Taj Mahal was originally supposed to build at Burhanpur. The foundation of the Taj was actually started in Burhanpur. Agra became the final choice because of the problems and costs involved in the transportation of marble from Rajasthan. The site that was chosen for Taj in Burhanpur is still vacant near the Tapti river. Multani mitti is a very common facial in India which is used by women to glow their skin. Have you a thought that a monument can get Multani mitti facial. Yes, Taj does. Taj Mahal is getting dirty and changing its colour due to excessive dirt and pollution. ASI have planned to give multani mitti facials to Taj so that it can get rid of all the dirt. There is actually a black Taj Mahal (Kala Kala Taj Mahal) in Burhanpur, India. Tomb of Shah Nawaz is known as Black Taj by locals. The tomb is located at Teressa, Burhanpur in Madhya Pradesh. It was built very near to the Utavali River. It is a beautiful monument which is much shaped like the Taj though but it is built on a much smaller scale and budget. The monument owes its name to the local black stones that are used for its construction. The Bibi Ka Maqbara is a tomb located in Aurangabad, Maharashtra, India which is also known as Poor Man’s Taj Mahal due to its striking resemblance to the famous Taj Mahal. It was commissioned by Aurangzeb’s Son Azam in the memory of his Mother Dilras Banu Begum. An inscription found on the main entrance door of Bibi Ka Maqbara mentions that this mausoleum was designed by an architect Ata-ullah. The interesting fact is that Ata-ullah was the son of Ustad Ahmad Lahauri who is said to be the principal designer of the Taj Mahal. The monument is also called the Dakkhani Taj or Taj of the Deccan. 10. 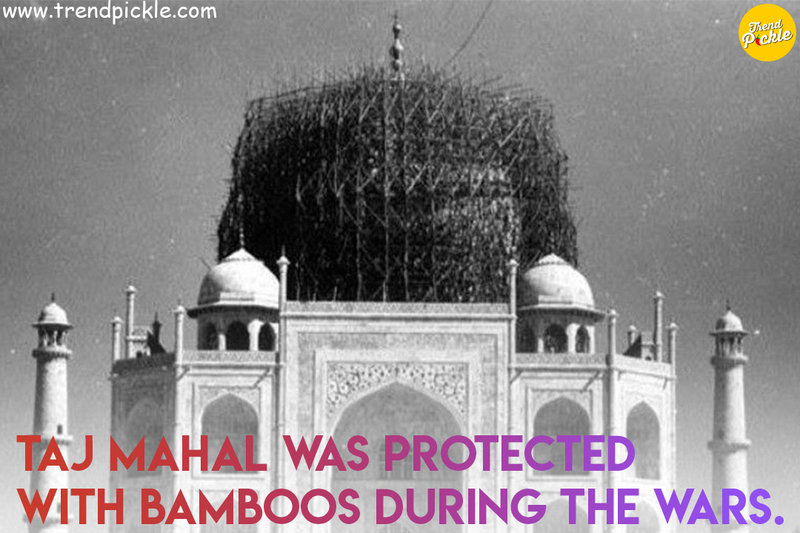 Taj Mahal was protected with bamboos during the wars. Taj Mahal is one of the most important heritage of India so it was always vulnerable to attacks during wars. In 1942, the British thought that the Taj Mahal was vulnerable to bombing, so they placed bamboo scaffolding over the Taj Mahal to protect it. The same technique was applied by the Indian government when India was fighting a war against Pakistan in 1965 and 1971. The images show only the dome of the structure to be covered with bamboo however it is believed the whole Taj was covered with bamboos. The purpose of covering Taj was to make sure that monument looked like bamboo stockpile from any bomber plane. Do you know any more secrets or mysteries of Taj Mahal, do let us know in the comment section. Bollywood Quiz – Can You Guess The Bollywood Movie Name Just By Screenshot? I hope I can see Taj Mahal live one day. it looks beautiful!